Nine years ago, pre-blogging, I embarked on a personal project to seek out and revisit my favorite childhood books. Many of them I knew only by vague memory, and didn’t even have a title to guide my search. Sometimes, despite reading a book hundreds of time, I could only remember a single scene with enough clarity to google. Imagine trying to find a book solely from a scene where a dog chases a mouse across a pool covered with plastic…yeah. It wasn’t easy. In the end, though, I eventually found every single one of the childhood books I’d wanted to revisit, and I spent the next few years revisiting almost all of them. In fact, I’ve probably reread 95% of all my favorite books from childhood and adolescence. All but one of the list below were part of that project, and every single one remains a nostalgic favorite. 1. 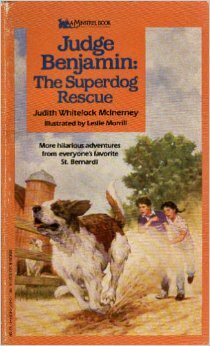 Judge Benjamin: The Superdog Rescue by Judith Whitelock McInerney – This is the book I referenced above, and I’m amazed that I found it because that particular scene I remembered is at the very beginning and only about two pages long… When I went back to read it, though, I remembered nearly every word. I must have read this book several hundred times as a kid. 2. Ghost Cat by Beverly Butler – This was easy to find, because I knew the title and remembered the cover, plus most of the plot. I reread it for RIP a few years back! 3. A Wrinkle in Time by Madeleine L’Engle – This book came in a set with four other children’s classics, including the next two in this list. I revisited it a few years back, and while I still have nostalgia attached to it, I didn’t really like it as an adult. 4. The Egypt Game by Zilpha Keatley Snyder – This was probably my very favorite childhood book, and when I reread it as part of this project, I discovered that many of my personal preferences in books plus some of my writing style can be traced back to The Egypt Game. The author is very nice too, and responded to a letter I wrote her! 5. From the Mixed Up Files of Ms. Basil E. Frankweiler by E.L. Konigsburg – This is the only one on this list I haven’t revisited in adulthood, so I still remember it purely with nostalgia. It’s definitely one I plan to revisit, though. 6. Bridge to Terabithia and The Great Gilly Hopkins by Katherine Paterson – Both of these were beloved children’s books. Ironically, when Terabithia came out on film, I didn’t know I’d read the book. I remembered a scene, but not which book it came from, and I blew off the movie. Then later I looked up the scene, discovered it was this book, and had to both reread and watch the film. 7. 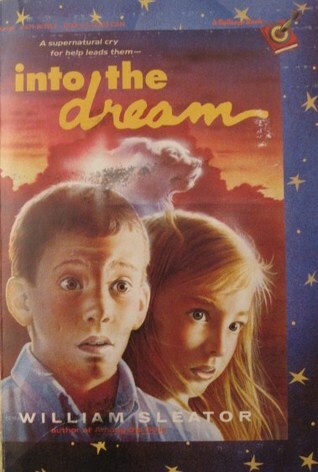 Into the Dream and Singularity by William Sleator – I didn’t read a whole lot of science fiction as a kid, but both of these books, read around middle school, had profound effects on me. Images and scenes have stayed with me to this day. 8. Wait Till Helen Comes by Mary Downing Hahn – This was the only book I couldn’t find during my project search. All I could remember was a scene with kids trapped in a ruined basement and a fight in a kitchen. Not helpful. I only know it now because in 2009, I participated in a reading challenge that accidentally brought me to this book. 10. 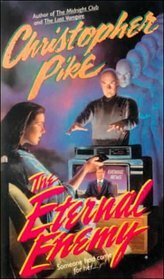 The Eternal Enemy by Christopher Pike – I also read tons of Christopher Pike as a teen, but this is the one I remember most clearly. It took me forever to find it, because I only knew the author and pieces of the plot, and Pike has written so many books! 11. Tiger Eyes by Judy Blume – I know, I know, this is more than ten. But I couldn’t leave these last two out. Again, I read a lot of Blume as a kid/teen, but this was the one that made the biggest impression on me. Rereading it as an adult was a very strange experience. 12. Twisted by R.L. Stine – Like the last few, I read lots of Stine’s books (though this was pre-Goosebumps, and I never read those). Most were forgettable, but this particular one about good-twin-bad-twin stuff was fascinating (if cheesy). What are your childhood favorites? I love so many of the books on this list! I remember reading The Egypt Game, From The Mixed Up Files, and The Great Gilly Hopkins. I wish I’d kept some sort of record as a kid! I was firmly in the Judy Blume camp as a kiddo (my mom was a huge fan), but I have to say, even visiting your review link, I scarcely remember Tiger Eyes! Maybe it was one of the ones I missed. I do have very clear memories of Deenie, Otherwise Known as Sheila the Great, Then Again, Maybe I Won’t (hiiii, voyeurism), and It’s Not the End of the World (which became especially relevant for me when my parents split up). Oh man. I want to go back and check them out now and see if they’re still decent! As far as your other reads, the only other one I’ve also read is From the Mixed-Up Files, and it will forever remind me of elementary school and (possibly) a computer game based on the book. I would love to revisit it. I’m glad that it seems like a few of these withstood the test of time for you! I honestly didn’t know much of Judy Blume as a kid. Tiger Eyes was one of the rare ones, and I’m surprised my mom let me read it at the age I read it. I haven’t read any of the others you mentioned. Oh I LOVED Ms. Basil E. Frankweiler!! Most of these others I haven’t read–including Wrinkle in Time which I’ve been meaning to get to for years. I read Bridge to Teribetha a few years ago and wasn’t blown away. I think some books really are just better when you read them at the age they were aimed for? I think that’s probably true. i only read Anne of Green Gables a few years ago, for instance, and I just didn’t see the appeal. Same with the Narnia Chronicles, which I was first exposed to as a senior in high school! Seriously girl. You. Me. Copacetic. Ghost Cat. Yes. The Egypt Game. Yes. Bridge to Terabithia. Yes. Down a Dark Hall. Yes. Pike, Stein, Duncan, Blume. YES!!!! OMG! I’ve never met ANYONE who had read Ghost Cat growing up!!!!! Frickin’ awesome Trisha! 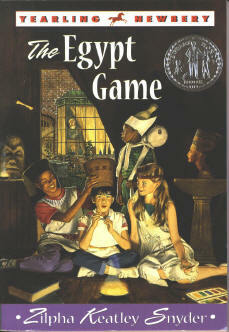 The Egypt Game and From the Mixed Up Files of Ms. Basil E. Frankweiler are two titles I remember, though I recall almost nothing about the books. I reread Bridge to Terebithia a few years ago and A Wrinkle in Time for the first time as an adult (not particularly impressed, but I can see how I might have liked it more as a kid). For me, I’d definitely like to revisit Anne of Green Gables and the Little House on the Prairie books. Also, a pair of books by Monica Furlong called Wise Child and Juniper that I remember really liking. Ooh! And Patricia C. Wrede’s Enchanted Forest Chronicles! I really should just do it, because the few childhood favorites I have revisited — most recently Pennies for the Piper by Susan McLean — I really enjoyed. Anne of Green Gables is one of those books I only read in adulthood (maybe four years ago?) and while I’m not sure if I’d’ve liked it as a child, I was unimpressed as an adult. It wasn’t bad or anything, just didn’t make any sort of impression on me. I’ve never read the Little House books either. I wasn’t much for country-life kinds of books, I guess!